A historic building housing a popular pub in Rotherham town centre has gone up for sale. The High House is a three storey building prominently positioned close to the Town Hall. The internal trading areas are split into two distinct venues: the High House pub and Fubar, in the basement. Chartered surveying firm, James A Baker, is now listing the freehold of the Moorgate Street building for sale at £210,000 plus VAT. The gross internal area (GIA) on the ground floor is 2,613 sq ft and that the plot size amounts to circa 0.16 acres. The listing states that: "The High House comprises an open plan bar area set around a central servery with perimeter and tiered seating with additional games area. Ancillary trade areas include customer WC's, glass wash, commercial kitchen and basement cellarage. "Fubar is located in the basement and is accessed seperately from an external staircase. Set around a central servery, the floorplate is open plan with perimeter boothed seating. The venue benefits from customer WC's and shares the same beer cellar as the pub. "Private accommodation is spread across the first and second floors, comprising five double bedrooms, kitchen, living room, office, bathroom and stores. Externally and to the front there is a benched trade patio, whilst to the side there is car parking for up to seven vehicles." The building is of brick construction with part painted and rendered elevations, which sits beneath a number of pitched tiled roofs. Whilst not a listed building, the property is on Rotherham Civic Society's local list which compiles properties of architectural or historic interest. The society states that from 1856 onwards the High House was licensed as an Inn with "the first licensee being Charles Dobb who also traded as a stone mason / builder." Historians had previously said that the High House was once a "school for young gentlemen" but this has not been verified. The High House continues to trade and the "new fubar" is reopening this weekend on June 16. The sale particulars add that: "The High House offers considerable scope for local and regional public house and bar operators to build on the existing wet trade and introduce a food offering. The property also has a wide range of alternate uses subject to the granting of the necessary permissions and is likely to be of interest to owner occupiers, investors, builders and developers." The property sits near to the Cross Keys pub which sold at auction for £141,000 in 2016 but has continued to remain vacant. Also on The Crofts is the George Wright boutique hotel, bar and restaurant which has recently opened following a £500,000 revamp. 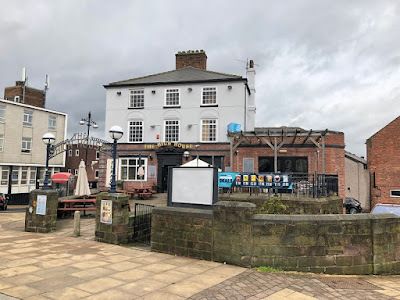 James A Baker is also advertising the sale of the freehold at The Ship Inn - a traditional two storey public house located in the Rotherham suburb of Greasbrough.